Scientists from across the world gathered at nearby Fermilab to celebrate the impact of the Tevatron. Attendees kicked off a daylong symposium with a close up look at the historic particle accelerator. 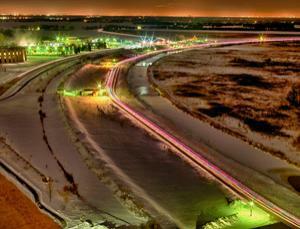 The Tevatron may now be defunct, but it is still detangling the nature of matter from beyond the grave. The late particle-smasher’s two main experiments, CDF and DZero, have released the most precise measurement yet of the mass of the W boson, one of the fundamental particles in the standard model of particle physics. The new measurements, combined with earlier data from other detectors, places the W boson’s mass at 80.385 gigaelectronvolts (GeV), plus or minus 0.015 GeV. The measurement puts constraints on the mass of the Higgs boson – the long-sought missing piece that would complete the standard model and explain why all other particles have mass – placing it right where experimentalists want it. The standard model is our current best picture of the menagerie of particles and forces that make up the universe and explains how they interact. But it cannot predict exactly how much each of those particles weighs; it can only describe how their masses are related to each other. The Tevatron, which was housed at Fermilab in Batavia, Illinois, and turned off in September 2011, and the still-running Large Hadron Collider at CERN, near Geneva, Switzerland, have hunted the Higgs boson directly. Last December, physicists at the LHC announced tentative hopes that the Higgs had finally turned up, with a mass of about 125 gigaelectronvolts (GeV). But thanks to the relationships laid out in the standard model, physicists can also predict at which mass the Higgs should show itself based on the masses of other particles, like the W boson and the top quark. “The mass of the W boson is correlated with the mass of the top quark, which we here at Fermilab can measure very precisely,” says Dmitri Denisov, spokesman for the DZero experiment. And if the Higgs exists, the mass of the W boson is also correlated with the Higgs mass, he says. Previous to the latest result, DZero and CDF – which use different and independent techniques to make similar particle measurements – had placed the W boson’s mass at 80.4 gigaelectronvolts, give or take about 0.045 GeV. That was the most precise measurement of the W boson’s mass at the time, but it was still not good enough, Denisov says. Taken together with the top quark, the earlier W boson measurement pointed to a Higgs that weighed about 90 GeV, a mass that had already been searched through and excluded by previous experiments. That opened the door to possible physics beyond the standard model. But now, armed with about half the data the Tevatron produced over the course of its 28-year lifetime, the standard model is looking healthy again. The result is consistent with a Higgs weighing between 115 and 127 GeV, which fits with the standard model’s predictions, and with CERN’s tentative findings. But it also allows the Higgs to be as massive as 152 GeV, which would require some extra particles or other deviations from the standard model. Denisov says the Fermilab teams still have half of the Tevatron’s data to comb through, so their precision will probably improve. The LHC collaborations are also refining their searches, and expect to have enough data to rule the Higgs boson in or out by the end of this year. “In the next six to 12 months at most, it will be clarified,” Denisov says. “But if [the Higgs] will be found here, then I will drink a second time. Because then everything will really fit.”……….. 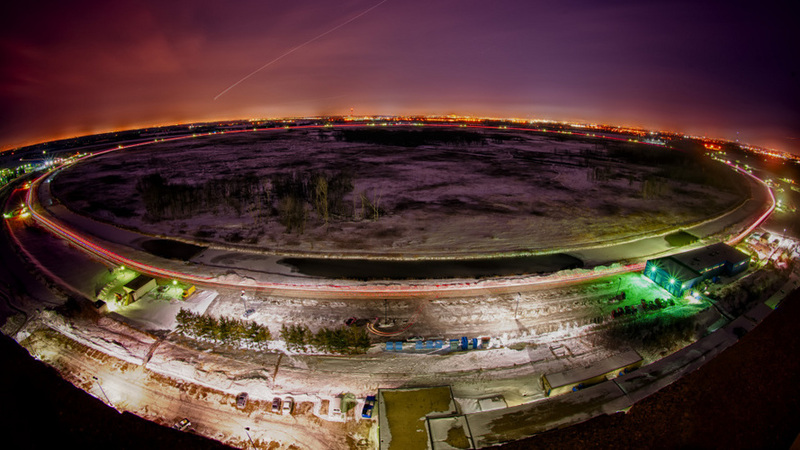 Vehicle lights and shooting stars illuminate the four-mile-long Tevatron ring. On the grounds of a science laboratory near Chicago, a physicist named Dmitri Denisov walks up wooden steps to the top of something that looks sort of like an abandoned railroad bed. The tall mound of dirt he’s standing on stretches off into the distance, forming a huge circle nearly four miles around — and the inside of this ring is filled with acres of restored prairie. The machine, which Denisov is standing on, is called the Tevatron. Beneath this earthen berm is a tunnel that serves as a high-tech racetrack for protons and anti-protons. They accelerate to almost the speed of light, and then slam together in collisions that spew out the hidden particles that make up matter. A view inside the Tevatron ring, currently in its final days as a particle superhighway. 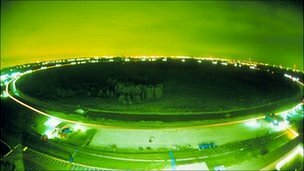 The Tevatron has been the pride of the Fermi National Accelerator Laboratory for a quarter of a century. But at the end of this month, the Tevatron is shutting down. It’s no longer the most powerful machine in the world for smashing bits of atoms together so that scientists can search through the subatomic rubble. That title belongs to the Large Hadron Collider near Geneva. Its circular racetrack for particles is 17 miles around, and this new collider is now the big draw for the world’s physicists. U.S.-based physicists said on Monday they hope to have enough data by the end of this month to establish if the elusive Higgs boson, a particle thought to have made the universe possible, exists in its long-predicted form. The physicists, at the Fermilab research center near Chicago which operates the Tevatron collider, have been in friendly competition with colleagues at CERN near Geneva whose giant LHC machine is also seeking the Higgs. Both Tevatron, operating for the past 28 years, and CERN’s Large Hadron Collider, started up on March 30 2010, have been trying to find the boson — postulated as the particle that gave mass to matter after the Big Bang 13.7 billion years ago — within that range. If it is not there, scientists say, then the multi-national research teams at both centres will have to start looking in the data gathered and more to come for something else — a different sort of Higgs or some other particle. But if it is somewhere there, Yurkewicz and her Fermilab colleague Robert Roser say, the Tevatron would not have enough data to confirm its existence before September 30 — when the U.S. collider, denied necessary funds, closes down for good. Scientists at both centres say there will have to be multiple sightings of the Higgs — each of which will have to be minutely scrutinized to ensure they are what they appear to be — before a discovery can be announced. Reaching the conclusion that it is not where it should be is much easier. In the two machines — the LHC oval-shaped and the Tevatron circular but smaller — particles are smashed together at near the speed of light, recreating the primal chaos of flying matter a tiny fraction of a second after the Big Bang. The result of those collisions — and there have been trillions of them — are recorded on computer disc and studied by scientists around the world for any trace of the Higgs, a key element of the Standard Model, and of any new phenomena. 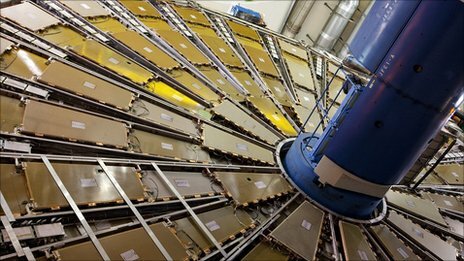 Scientists at CERN, formally the European Organization for Nuclear Research, have themselves been gathering data from collisions at an ever-growing rate but have yet to spot more than a fleeting hint that it might exist. “The Higgs boson has been rather elusive so far and no-one really knows what it will look like,” wrote CERN scientist Paulime Gagnon in her blog on Monday. CERN’s director-general Rolf Heuer has said he expects proof one way or another to emerge in 2012, at the end of which the $10 billion LHC will shut down for a year to be prepared for collisions at twice the present force. But some CERN researchers have suggested that the vast amount of data they are collecting could allow them to come to at least a preliminary conclusion — Higgs or no Higgs — by the end of this year. A US particle machine has seen possible hints of the Higgs boson, it has emerged, after reports this week of similar glimpses at Europe’s Large Hadron Collider (LHC) laboratory. The Higgs boson sub-atomic particle is a missing cornerstone in the accepted theory of particle physics. 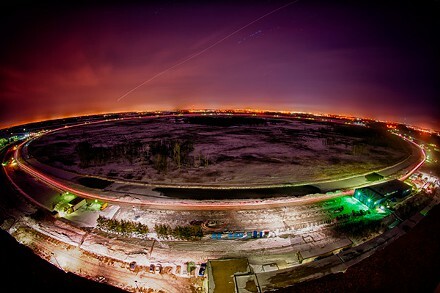 Researchers have been analysing data from the Tevatron machine near Chicago. The hints seen at the Tevatron are weaker than those reported at the LHC, but occur in the same “search region”. Physicists have cautioned that these possible hints could disappear after further analysis. But researchers also say when the US and European results are taken together, they start to paint an “intriguing” picture. The results are being presented and discussed at the Europhysics conference in Grenoble, France. The Tevatron and LHC machines work on similar basic principles, accelerating beams of particles to high energies around a tunnel before smashing them together. These collisions can generate new particles which can then be picked up by detectors built at the points where particle beams cross over. 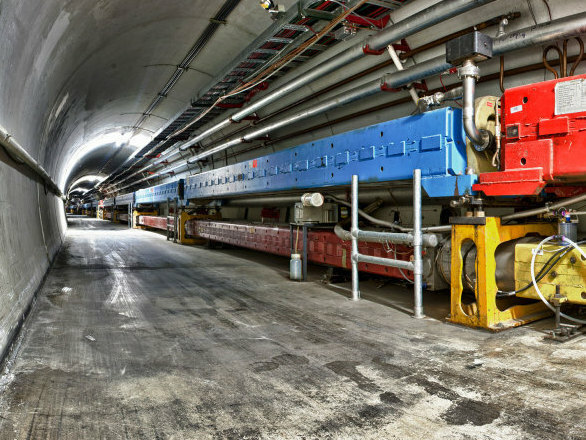 The LHC, which is housed in a 27km-long circular tunnel below the French-Swiss border, has two detectors looking for the Higgs: Atlas and CMS. Each is staffed by a different team of scientists. The Tevatron has a comparable arrangement, with two detectors called DZero and CDF. On Friday, the Atlas and CMS teams reported finding what physicists call an “excess” of interesting particle events at a mass of between 140 and 145 gigaelectronvolts (GeV). The excess seen by the Atlas team has reached a 2.8 sigma level of certainty. A three-sigma result means there is roughly a one in 1,000 chance that the result is attributable to some statistical quirk in the data. Now, the US DZero and CDF experiments have also seen hints of something at about 140GeV. Professor Stefan Soldner-Rembold, spokesperson for the DZero detector team, told BBC News: “There are some intriguing things going on around a mass of 140GeV. The Tevatron is also seeing the same type of interesting particle events as the LHC. In these events, one elementary particle “decays”, or transforms, into another with a smaller mass. The interesting fluctuations seen at the Tevatron and the LHC are dominated by what might be the Higgs decaying into a pair of “W boson” particles. But the Tevatron results are currently at the one-sigma level of certainty – a lower level of statistical significance than those presented by the Atlas and CMS teams. Five-sigma is the level of certainty generally required for a formal discovery. At this significance level there is about a one in 1,000,000 chance that a bump in the data is just a fluke. However, says Professor Soldner-Rembold, the fact that teams working independently are now seeing similar phenomena point to an exciting possibility. The existence of the Higgs boson was first proposed in the 1960s by Edinburgh University physicist Peter Higgs. The boson helps confer the property of mass on all other particles through their interaction with something called the Higgs field. The efforts put into finding the boson relate to its status as the last missing piece in the the Standard Model – the most widely accepted theory of particle physics. The Standard Model is a framework that explains how the known sub-atomic particles interact with each other. If the Higgs boson is not found, physicists would have to find some other mechanism to explain where particles get their mass. WHY the universe is filled with matter rather than antimatter is one of the great mysteries in physics. Now we are a step closer to understanding it, thanks to an experiment which creates more matter than antimatter, just like the early universe did. Our best understanding of the building blocks of matter and the forces that glue them together is called the standard model of particle physics. But this does a poor job of explaining why matter triumphed over antimatter in the moments after the big bang. The standard model has it that matter and antimatter were created in equal amounts in the early universe. But if that was the case they should have annihilated in a blaze of radiation, leaving nothing from which to make the stars and galaxies. Clearly that didn’t happen.